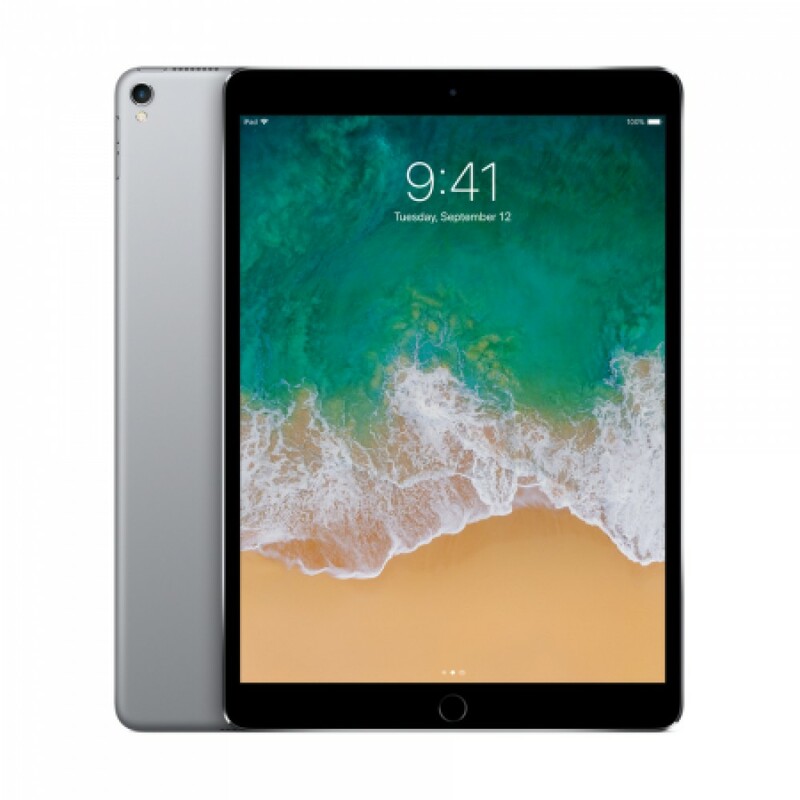 Capacity:- 64 GB .Display :- 10.5″ Retina display 10.5-inch (diagonal) LED-backlit Multi..
- 10.5″ Retina display 10.5-inch (diagonal) LED-backlit Multi-Touch display . - 2224-by-1668 resolution at 264 pixels per inch (ppi) . - Wide color display (P3) . - True Tone display . - Fingerprint-resistant oleophobic coating . - Fully laminated display . - A10X Fusion chip with 64‑bit architecture . - Embedded M10 coprocessor . - Digital zoom up to 5x . - Optical image stabilization . - Panorama (up to 63 megapixels) . - Sapphire crystal lens cover . - Backside illumination sensor . - Hybrid IR filter . - Autofocus with Focus Pixels . - Tap to focus with Focus Pixels . - Live Photos with stabilization . - Wide color capture for photos and Live Photos . - Improved local tone mapping . - Body and face detection . - Auto HDR for photos . - Auto image stabilization . - 4K video recording at 30 fps . - 1080p HD video recording at 30 fps or 60 fps . - 720p HD video recording at 30 fps . - Optical image stabilization for video . - Quad-LED True Tone flash . - Slo‑mo video support for 1080p at 120 fps and 720p at 240 fps . - Time‑lapse video with stabilization . - Cinematic video stabilization (1080p and 720p) . - Continuous autofocus video . - Take 8-megapixel still photos while recording 4K video . - 1080p HD video recording . - iPad to any FaceTime-enabled device over Wi-Fi or cellular . - FaceTime audio iPad to any FaceTime-enabled device over Wi-Fi or cellular . - Four speaker audio . - Dual microphones for calls, video recording, and audio recording . - All models Wi-Fi . - Ambient light sensor . - Secure personal data within apps . - Make purchases from the iTunes Store, App Store, and iBooks Store . - Use your voice to send messages, set reminders, and more . - Get proactive suggestions Use hands-free . - Listen and identify songs . - 10.5‑inch iPad Pro . - Built‐in 30.4‐watt‐hour rechargeable . - Up to 10 hours of surfing the web on Wi‐Fi, watching video, or listening to music Charging via power adapter or USB to computer system . - With new features and capabilities that let you get more done quickly and easily, iOS 11 makes iPad more powerful, personal, and intelligent than ever . - Accessibility features help people with disabilities get the most out of their new iPad Pro. With built-in support for vision, hearing, physical and motor skills, and learning and literacy, you can create and do amazing things . - Features include : VoiceOver, Zoom, Magnifier, Siri and Dictation, Switch Control, Closed Captions, AssistiveTouch, Speak Screen . - Apple ID (required for some features) . - Frequency response: 20Hz to 20,000Hz . - Audio formats supported: AAC (8 to 320 Kbps), Protected AAC (from iTunes Store), HE-AAC, MP3 (8 to 320 Kbps), MP3 VBR, Dolby Digital (AC-3), Dolby Digital Plus (E-AC-3), Audible (formats 2, 3, 4, Audible Enhanced Audio, AAX, and AAX+), Apple Lossless, AIFF, and WAV User-conﬁgurable maximum volume limit . - AirPlay Mirroring, photos, audio, and video out to Apple TV (2nd generation or later) . - Video mirroring and video out support: Up to 1080p through Lightning Digital AV Adapter and Lightning to VGA Adapter (adapters sold separately) . - Supports Dolby Vision and HDR10 content . - Video formats supported: H.264 video up to 4K, 30 frames per second, High Profile level 4.2 with AAC‑LC audio up to 160 Kbps, 48kHz, stereo audio or Dolby Audio up to 1008 Kbps, 48kHz, stereo or multichannel audio, in .m4v, .mp4, and .mov file formats; MPEG‑4 video up to 2.5 Mbps, 640 by 480 pixels, 30 frames per second, Simple Profile with AAC‑LC audio up to 160 Kbps per channel, 48kHz, stereo audio or Dolby Audio up to 1008 Kbps, 48kHz, stereo or multichannel audio, in .m4v, .mp4, and .mov file formats; Motion JPEG (M‑JPEG) up to 35 Mbps, 1280 by 720 pixels, 30 frames per second, audio in ulaw, PCM stereo audio in .avi file format . - Operating ambient temperature : 32° to 95° F (0° to 35° C) . - Nonoperating temperature : -4° to 113° F (-20° to 45° C) . - Relative humidity : 5% to 95% noncondensing . - Operating altitude : tested up to 10,000 feet (3000 m) . - Size : 9.8 inches (250.6 mm) x 6.8 inches (174.1 mm) x 0.24 inch (6.1 mm) . - Weight : 1.03 pounds (469 grams) . - Lightning to USB Cable . - USB Power Adapter .